We'd like to shine a spotlight (or marquee light!) on another local business that played a part in making our restaurants so beautiful. You may or may not have noticed the tables, water stations and register counters in our Hillsboro Village and Franklin locations with their lovely wood grain and rich, gorgeous tones that really tie the rooms together! Like almost everything at Biscuit Love, these were hand made and made with love here in Nashville by Mothers Woodshop, run by Bill and Mary Ellen Peden. We recently asked Bill a few questions so you can get to know them a little more! Tell us about Mothers Wood Shop! Bill: Mothers Woodshop is a local, family run business designing and creating unique, hand-made furniture. What started as a labor of love has grown into an opportunity for Mary Ellen and I to collaborate in creating beautiful objects that serve people. We love working together, and, at the end of the day, want to create useful, meaningful pieces of furniture that enrich lives. 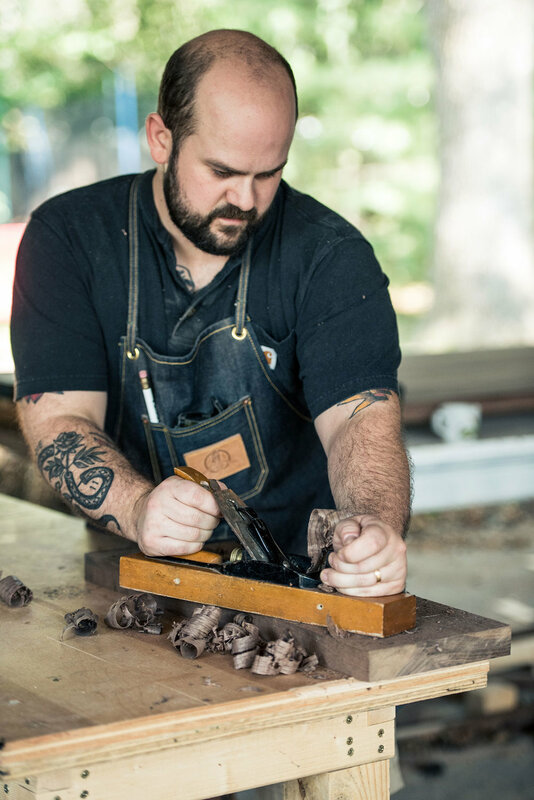 Like your grandfather’s pen knife or your mother’s cast iron skillets, we work hard to create lasting furniture that can contribute to the lives of others. What inspired you to pursue building furniture and working with wood? Bill: My inspiration for building furniture came from our children. Our boys were sprouting like weeds, and it became apparent that their bedroom could use a bit more space in which to move around. I connected with a friend who is a carpenter, and he helped me design and construct a pair of simple lofted beds to turn our children's bedroom into a veritable treehouse. Soon after my mother mentioned wanting a farmhouse table, and I offered to build it. Her table was Mary Ellen and I's first piece of furniture to build together, and the experience was incredible. We quickly became infatuated with the process of taking raw materials and creating something beautiful. Needless to say, we've been hooked ever since. Where do you source for your materials? All of our materials are sourced from local hardwood mills and independent sawyers. We try and support local businesses as much as possible, and strive to find the finest materials available to Middle Tennessee. Tell us about the tables at Biscuit Love! 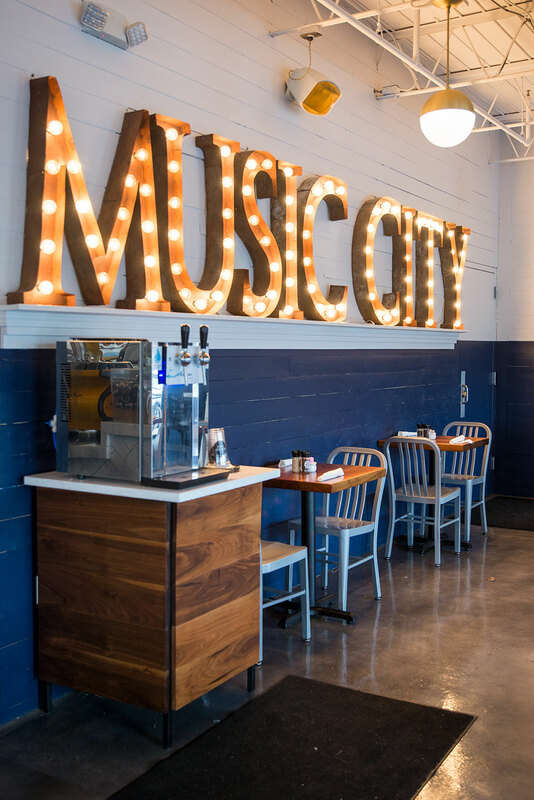 The tables at Biscuit Love are all constructed from Tennessee Walnut. When initially speaking with Sarah and Karl about the table designs, they were adament about letting the depth and beauty of the wood sit center stage. This can be seen in the contrasting heart and sap wood throughout the tables, as well as the various wood figures that are on display. As a furniture maker I'm always thrilled when the natural beauty of wood is allowed to shine, and I believe this is particularly true with the tables at Biscuit Love. We have a pair of Walnut and Maple Bedside Tables currently on our workbench, and have a few custom tables sitting on deck. We are also creating a few signature pieces of furniture we hope to offer on our website this year. Favorite dish at Biscuit Love? Bill: French Omelette - it's perfect every time! Mary Ellen: Biscuits & Sausage Gravy, with a side of grits because DUH!